Being the day before my birthday, when my husband said he would take our toddler and go grocery shopping – so I could get some study done – I was half-expecting the shopping trip to have a secondary motive. But I said nothing, and expected nothing in particular. “No, mum. The big grey one,” she replied, pointing in the direction of the backyard. Now I was even more confused. I thought perhaps we might have left one of her elephant toys outside at some point. “Take me and show me what you mean,” I asked her. “Your secret elephant,” she explained further, and it was with much hilarity that I realised Aidan had bought me an elephant for my birthday. A secret elephant, obviously, which he had instructed her not to tell me about! However, as she let the cat – or the elephant – out of the bag, Aidan decided there wasn’t much point in being secretive about him, so here he is! My birthday present, a day early. I’m calling him Monty. 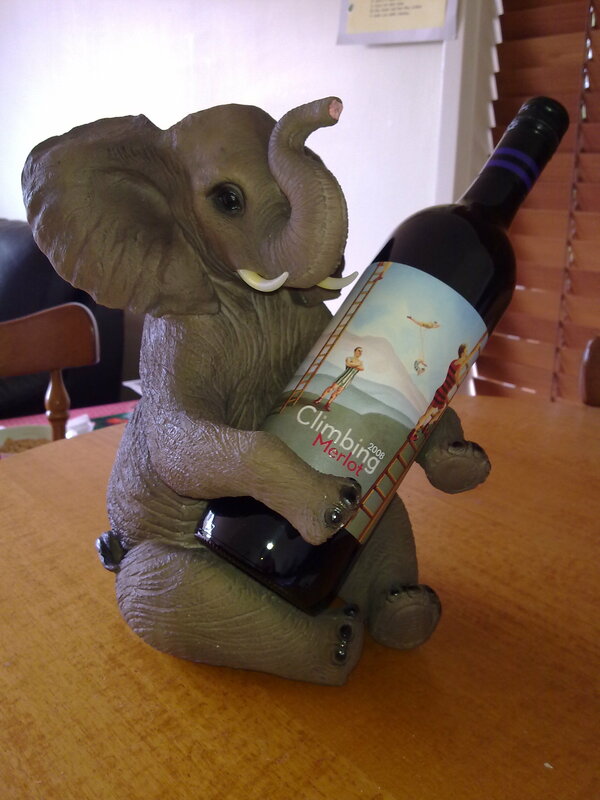 Monty the Wine-bearing Elephant. I love him! This morning dawned bright and clear, despite a chilly night and frosted grass. The morning was filled with preparations, including a few last-minute, unforeseen things like needing to buy coffee. 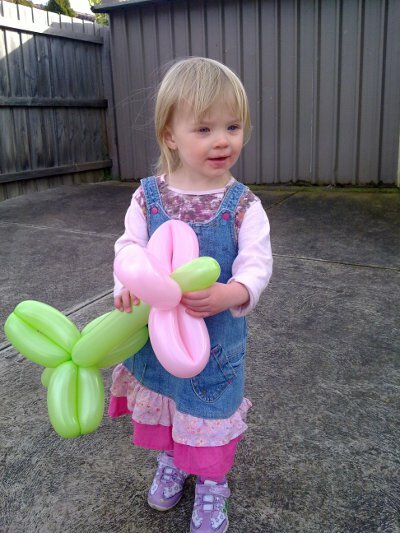 Balloons were tied all around our fences so we could be easily found, food was prepared, the outdoor table cleaned. Parents and in-laws all arrived early with some necessities such as chairs and extra food. Then proper party time rolled around, and people started showing up! I’d invited basically everyone I knew with children (because I like them, not just because they have kids), and happily almost everybody was able to come. The backyard, contrary to my expectation, was not at all too small, and everybody was able to mingle and play comfortably. 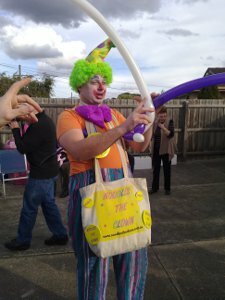 A little way into the party, as planned, Noodles the Clown turned up! 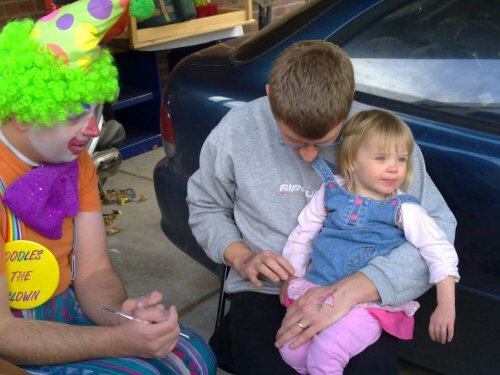 I’d booked him for a Balloon & Face Painting Party, with some reservations – was two a bit young for a clown? But to my delight, Noodles was just fantastic. He was professional and capable and talented, and dealt well with the huge range of ages present – from the youngest at 10 months, to the oldest child in his early teens. I was very impressed! I really wanted Elspeth’s birthday (and all her birthdays) to be something special, because we don’t celebrate Christmas so she’ll really only get one big party each year. He also made a sword for young Ben, and a lot of balloon banjos which even the adults had fun with! He even tried a dolphin, upon request, which apparently was very difficult but it looked pretty good to me! Elspeth didn’t want her face painted, but a lot of the other kids did, and Noodles didn’t seem to mind – he was very good about not pressuring her or making her feel uncomfortable. No face painting for me! I think I’m pretty safe in saying that a good time was had by all (except poor little Alexis who didn’t much like the balloons). But the afternoon wore on, as they tend to do, and children got tired and it began to get chilly, and people began to take their leave. And so a lovely day came to an end, and lucky Elspeth gets a second slice of birthday cake for dessert! My little Elspeth, who really isn’t so little anymore, turns two today! It is an oddly anti-climatic day; everything is quite normal and we aren’t celebrating until tomorrow. I’m not even sure if we’ll be giving any presents today! Probably Aidan will twist my arm so she’ll get at least one of the two we bought her. It’s hard to believe it’s been a whole two years – and hard to believe it’s only been two years! I find one of the oddest things about parenthood is the way time flows. It’s hard to remember a time before having a child, so it’s like I’ve always had one. But it also seems to have flown by so quickly! So many things have happened, so many milestones reached and passed – and so many yet to come! I won’t post any pictures today, because I’m sure I’ll have an abundance of them tomorrow! We’re having a party with a clown and balloons and face painting!